Several tablets based on AllWinner A31 quad core processor have been announced this week, such as Onda V972, but we did not really have full details on the processor. We now know more since AllWinner added product pages for two new (sun6i architecture) processors: AllWinner A31 and AllWinner A20. 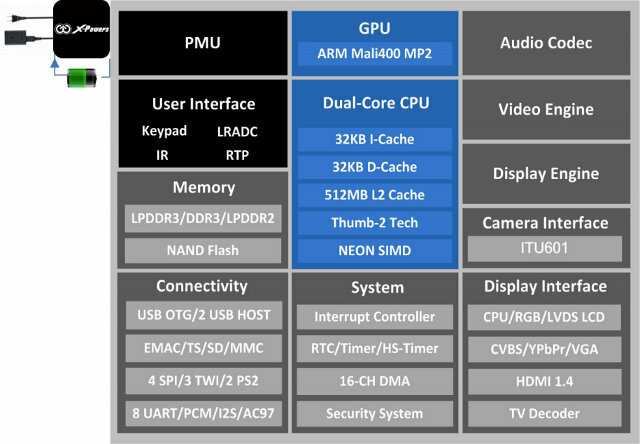 AllWinner A31 is a quad core Cortex A7 processor with an 8 core Power VR SGX544 GPU. 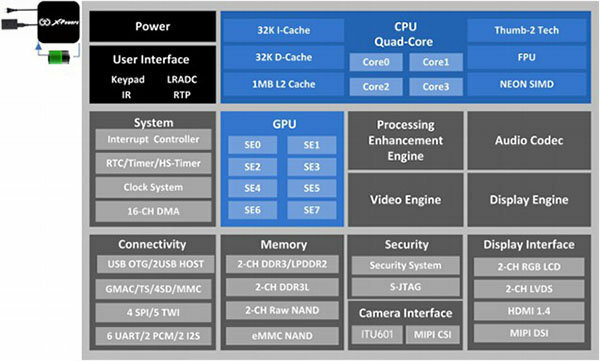 GPU – POWER VR SGX 544 with Eight logic cores. Open GL ES2.0, Open CL1.x and DX 9_3 compliant. The platform supports Android 4.2 and Microsoft Windows RT, but there’s no word about Linux. More on that at the end of the post. AllWinner A20 is a dual core Cortex A7 processor with a dual core Mali-400 GPU. AllWinner A20 supports Android 4.2 or above. AllWinner A20 is also pin-compatible with AllWinner A10, so existing products may soon be available for this low cost version. I still could not find any CPU clock details for either processor. AllWinner A31 is clearly destined at higher products with both Android and Windows RT, whereas AllWinner A20 is a low cost version for Android tablets and set-top boxes. Linux is not mentioned for any of sun6i processors, as AllWinner does not appear have Linux SDK, and Alejandro Mery – one of the main developers at sunxi-linux.org – said the community does not have any source for sun6i at the moment. Proper Linux support would be difficult for A31 due to the Power VR GPU, and it’s more likely work could be done on AllWinner A20, if GPL sources are made available.